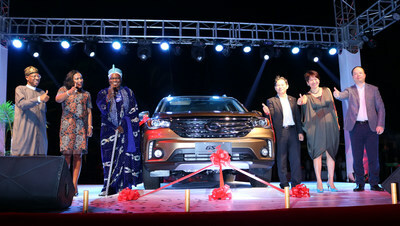 GUANGZHOU, China, Dec. 15, 2016 /PRNewswire/ — Leading automaker GAC Motor has released the company’s best-selling SUV GS4 in Africa at the launching ceremony on December 12 at Eko Hotel in Lagos, Nigeria. The event was attended by distinguished guests including Oba of Lagos HRH Oba Rilwan Akiolu, Lagos State Governor Akinwunmi Ambode, Minister of Information and Culture Alh. Lai Mohammed, Chinese Consul General in Nigeria Chao Xiaoliang, Nigerian Nobel laureate in Literature Wole Soyinka, representative of Aliko Dangote’s company, economic and commercial counselor of Chinese Consulate General in Lagos Liu Junsheng. “As a very well-known and one of China’s leading automobile manufacturers, GAC has once again shown the world its remarkable research and development progress and strength in the SUV field.” Said Chao at the launching ceremony. Instead of importing vehicles directly from China, the GS4 to be sold in Africa will be locally assembled as GAC Motor’s SKD project in Nigeria which was put into operation in November and assembled the first batch of GS4 cars successfully. “I knew GAC Motor’s GS4 is very popular in the Chinese market when I visited China in April for Sino-Nigeria business roundtable conference, unexpectedly the GS4 has already arrived in Nigeria in half a year and achieving local assembly production, we are very glad to welcome excellent Chinese companies like GAC Motor to bring the best quality products to Nigeria,” said Aderemi King, Oba of Osogbo, Nigeria. Released worldwide at the North American International Auto Show (NAIAS) in 2015, the GS4 was created with GAC Motor’s best technologies and global resources. A total of 37,000 GS4 cars were sold in China in the single month of November, retaining its second place ranking among all SUVs in the Chinese market. GAC Motor has sold more than 427,000 GS4 cars in China as the fastest growing vehicle model in the year and half after official release in the market. Yu Jun, general manager of GAC motor, noted that the GS4 launch in Nigeria not only reinforces GAC Motor’s brand in the Nigerian market, but also paves the way for the company to further expand in the African markets. “We are bringing the premium products and services that would exceed expectations to Nigeria and costumers in Africa, we believe GAC Motor’s GS4 will bring safer and more comfortable journeys and an brand new driving experience,” he said. Nigeria was GAC Motor’s first step in building up sales and service network in Africa and now is part of the company’s global network covering 14 countries in total. GAC Motor dealer shave successfully brought a variety of its signature vehiclesto Nigeria since entering the market, gaining bulk purchase orders from Lagos government, police stations and banks as official vehicles for showing strong product quality and positive brand image. GAC Motor has won the annual brand award in Nigeria by Urbanview Media Group, and its GS5 wowed the crowd at the Africa Magic Viewers’ Choice Awards known as the “Oscar” of Africa in March when GAC Motor was chosen as the exclusive car sponsor. As a fast-growing automaker that compounds an average of 80 percent annual growth rate in the past five years, GAC Motor has sold 335,000 cars from January to November in 2016, a 111 % year-on-year increase. “GAC Motor keeps in tune with the world since the first day of establishment, adhering to original design and international standards in building the world-class automobile manufacturing system which centers on GAC Motor’s global research and development network with the support of our strong production capacities and global supply chain, setting out on a development path that’s positioned to high-end market, prioritized to quality and driven by innovation,” said Yu Jun. GAC Motor plans to introduce the high-end automobiles including GS8 and GA8 in Africa starting in Nigeria,bringing more diverse options to local customers while further promote GAC Motor’s brand in Africa as well as the international development strategies. A subsidiary of GAC Group, GAC Motor develops and manufactures premium quality vehicles, engines, components and auto accessories, as of now achieving a year-on-year growth rate of 111% in 2016, the highest among all Chinese brands in the corresponding period. GAC Motor ranked 5th, among all brands in J.D. Power Asia Pacific’s 2016 China Initial Quality Study, the highest of all Chinese brands for the fourth consecutive year.